Display your photos with variety suitable to your diverse subject matter. 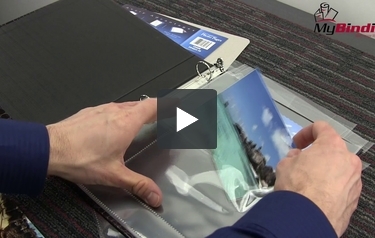 These Avery Photo Pages allow you to insert four 4" x 6" photos in each page. Three protective photo pockets offer the option of portrait and landscape orientation on the same page so you can properly appreciate your photos of both soaring skyscrapers and sunsets that stretch the length of the horizon. Prepunched holes let you fit the pages conveniently in standard three-ring binders. The pages are acid free and archival safe to ensure your many photos stay in top condition to show off again and again. Displays my 4 x 6 photos perfectly. I HAVE NEVER BEEN DISAPPOINTED WITH AVERY PRODUCTS. AND, ONCE AGAIN, I'M VERY CONTENTED. THESE PHOTO PAGES WORK PERFECTLY WITH THE THREE RING BINDER I'M ASSEMBLING THAT 8x10 PAGES OF WRITE UPS ABOUT THE PHOTOS AND THE HISTORY OF OUR 60 YEAR OLD CHURCH. THANKS VERY MUCH FOR YOUR SERVICE. I am a photographer and I use these 4x6 pages to organize all my prints - it allows me to easily create photo albums and portfolios for both my professional and personal work as well as maintaining my archive library. I like the quality of the pages as they are not too thin and not too thick - the photos are easy to insert and remove. The pages will fit in any standard three ring binder. I haven't found a lower price elsewhere. Customer service is phenomenal - professional, knowledgeable, friendly and fun! if you don't see an item you want, they will try to find it for you! Shipping is almost instantaneous! My favorite go-to supply source! Welcome to MyBinding video. Let's check out Avery's Photo Pages. Display your photos with the variety suitable to your diverse subject matter. These Avery photo pages allow you to insert multiple 4 x 6 or 2 x 2 photos on each page. All the while, allowing you the protection and organization you desire for your work. The pages are acid free and archival safe so you don't need to worry about the life of your photos or any imprinted materials you add to it because inks and toners will not transfer. Pre-punched holes let you fit the pages conveniently into a standard 3-ring binder and the plastic itself is crystal clear, giving off all the color you deserve. We sell them in packs of 10 sheets, which allow for 20 pages. There it is. That's the Avery photo page. For more demos, reviews and how to's, check out MyBinding.com.